WASHINGTON — A pair of low Earth-orbiting demonstration satellites built by Northrop Grumman Aerospace Systems for the first time on March 16 detected and tracked a ballistic missile launch through all phases of flight, a Northrop Grumman official said March 22. So-called birth-to-death tracking of a ballistic missile launch had never been done before from space and is the most significant achievement to date for the Space Tracking and Surveillance System (STSS) spacecraft, said Doug Young, Northrop Grumman’s vice president of missile defense and warning programs. 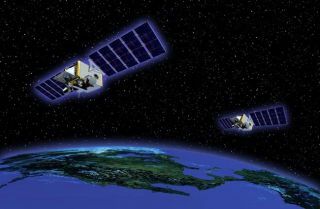 Los Angeles-based Northrop Grumman built three STSS demonstration satellites for the U.S. Missile Defense Agency (MDA). The first satellite, which had a classified mission, was launched in May 2009. After completing its test program, it was transferred Jan. 31 to the control of Air Force Space Command to continue supporting the service’s space situational awareness mission. The two unclassified STSS satellites were launched in September 2009 on a single United Launch Alliance Delta 2 rocket. During an extended on-orbit check-out and calibration phase that concluded in November, the satellites tracked multiple missile launches in the early boost and post-boost phases and demonstrated the ability to relay data from one satellite to the other. On March 16, an ARAV-B short-range target missile was launched from the Pacific Missile Range Facility at Kauai, Hawaii. An STSS satellite detected the heat signature of the launch with its acquisition sensor, and then its gimbaled tracking sensor locked on to the boosting missile, Young said. The tracking data was successfully relayed to the other satellite, which continued to observe the target as it coasted through space, re-entered the atmosphere and splashed down in the ocean, he said. Future STSS tests this year will be more sophisticated, Young said. In the coming months, the MDA will attempt to cue the STSS satellites to a missile launch using data from the operational Defense Support Program missile warning satellites, rather than the acquisition sensors on board STSS, he said. Another test this year will seek to determine if the STSS satellites can produce missile tracking data good enough to cue the launch of ship-based interceptors, a concept known as launch on remote. The Navy and MDA plan to conduct the first Aegis launch-on-remote intercept test next month, for which a forward-based AN/TPY-2 X-band radar will cue the launch of a Standard Missile (SM)-3 interceptor before the target missile is detected by the ship’s radar, MDA budget documents show. Similarly, the STSS demonstration satellites later this year will attempt to track a target missile and feed data to the Aegis system to generate a “fire control solution” for an early interceptor launch, Young said. However, an interceptor will not actually be launched in that test, he noted. Meanwhile, the MDA is pursuing an operational constellation of geosynchronous missile tracking satellites dubbed the Precision Tracking Space System. The agency will rely on the Johns Hopkins University Applied Physics Laboratory in Laurel, Md., to develop a prototype system to be launched in 2015. An industry team is expected to be chosen in 2014 to build between nine and 12 operational spacecraft planned to begin launching in 2018. The MDA aims to spend $1.34 billion on the Precision Tracking Space System between 2012 and 2016, budget documents show.